The Lumix DMC-GX7 is Panasonic's new compact system camera for keen prosumers. The Panasonic GX7 features the world's first built-in 90-degree tilt-able Live View Finder (LVF), a FourThirds sized 16-megapixel Digital Live MOS sensor, built-in pop-up flash and a tilt-able 3-inch touch-sensitive rear LCD screen with a resolution of 1040K dots. The DMC-GX7 also offers in-body image stabilization, magnesium alloy body, 1/8000th sec shutter speed, Full HD 1920 x 1080 60/50p movie recording with stereo sound and full-time auto-focus, 5fps continuous shooting, low-light focusing down to -4 EV, focus peaking, silent mode for street photography, built-in wi-fi and NFC connectivity, RAW support and an ISO range of 125-25600. 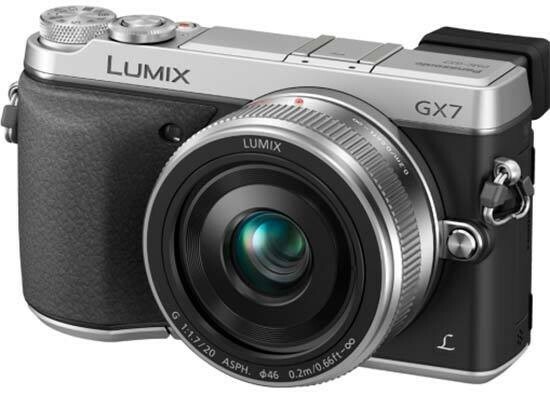 The Panasonic GX7 is available in black or silver for £819 / $999 body-only, £899 / $1099 for the 14-42mm kit, or £999 for the 20mm kit (not available in the US). The new Panasonic Lumix DMC-GX7 is officially the successor to the GX1, but things have moved on so quickly in the compact system camera world that this new model bears little resemblance to its forebear. So much so that Panasonic have taken the unusual decision to skip several possible model numbers to bring the GX7 in line with the rest of their range, which is why there's no GX2, GX3, GX5 or GX6. The GX7 carries on the same mantle of being a small, compact interchangeable-lens camera with all the functionality, controls and degree of customisation that an enthusiast could want, but it does so with even more bells and whistles and crucially with a higher price-tag. £819 / $999 for the body-only sees it competing against cameras like the Olympus OM-D E-M5, Sony NEX-7 and the Fujifilm X-Pro1, not to mention a plethora of mid-range DSLRs, so the GX7 is certainly up against some serious competition. Within the Panasonic range, only the flagship DMC-GH3 sits above the GX7, which with its DSLR-styling and video-centric positioning is an altogether different beast. The aluminium-bodied Panasonic GX7 is still a fairly small camera despite its added complexity, measuring 122.60x 70.7 x 54.6 mm and weighing 402g without a lens attached or battery inserted, although this is both bigger and heavier than the GX1. With a slim lens like Panasonic's 20mm pancake fitted, the GX7 is just about pocketable, although in a coat pocket rather than your trousers. With the supplied 14-42mm zoom lens the GX7 is much more at home in a small camera bag. The GX7 has a very chunky hand-grip on the right that really helps with the camera's handling, with more than enough room to accommodate three fingers. This works in tandem with the useful rubberized thumb-rest on the rear to ensure that it's easy to use the GX7 one-handed if you so desire. The GX7 sports an even more traditional design than the GX1, characterised by a svelter look. It's still not as overtly retro as the Olympus PEN series nor as futuristic as the Sony NEX-7, occupying a position mid-way between the two in terms of its design ethos. For the very first time on a prosumer Panasonic compact system camera, the GX7 has a built-in electronic viewfinder, and what a viewfinder it is! If ever there was a reason to end the debate about optical versus electronic viewfinders, this is it. Firstly, it has a staggeringly high resolution of 2764k dots, which translates into a display so good that you would swear it was an optical finder, helped in no small part by the high color reproduction of approximately 100% of the Adobe RGB colourspace. Secondly, there's a handy sensor which automatically detects when the camera is held up to eye-level and even starts auto-focusing, with just the slightest delay until the display is ready. 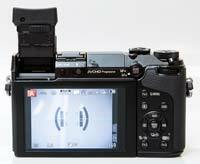 Thirdly, a whole host of information is displayed onscreen - virtually everything that you can display on the rear LCD screen can be shown in the EVF. 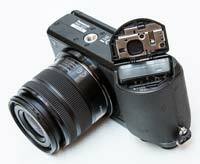 And last but not least, the viewfinder can be physically tilted through 90-degrees, acting as a conventional finder or a waist-level finder and anything in between. Suffice to say that we didn't miss having an optical viewfinder when shooting with the GX7. Working in tandem with the tilting electronic viewfinder is the tilting 3-inch LCD screen on the back of the GX7. The 1040K pixel, high-resolution screen delivers approximately 100% field of view and tilts up by 45 degrees and down by 80 degrees, useful for overhead or waist-level shooting. Panasonic say that the "front panel is directly attached to the In Cell Touch LCD without containing an air layer in-between, resulting in reduced reflection of external light", and we'd have to agree - it's one of the best screens that we've used in bright sunlight. The Monitor Luminance function can be set to automatically detect the current lighting conditions and boost the LCD backlighting by up to 40% when shooting outdoors in bright sunshine, helping to keep the screen visible, or you can manually set it to one of three levels. The Micro Four Thirds system is now very well-established, with a lot of excellent lenses on offer from Panasonic and Olympus that cover almost all of the popular focal lengths. You can also use regular Four Thirds lenses or even Leica D lenses via optional adapters from either Panasonic or third-parties, but lenses that are not compatible with the GX7's Contrast AF function can only be used with manual focusing and cannot use the Tracking AF, AFc (Auto Focus Continuous) or Continuous AF functions. Just like every other Panasonic compact system camera, optical image stabilisation is supplied via the lens, in this case the 14-42mm optic. But unlike every other Panasonic compact system camera, the GX7 also offers image stabilisation built-in to the camera body too, a surprising but very welcome development. Panasonic were keen to point out that this is of benefit for Leica lens owners, but obviously it applies to lenses from heir main rival, Olympus, too. At a stroke, you can now fit any Olympus Micro Four Thirds lens to the GX7 and benefit from image stabilisation. When an optically stabilised lens is fitted, the GX7 defers to the lens rather than using the body-based system (you can't manually choose between the two), with Panasonic stating that the optical image stabilisation supplied via the lens is still the best system - but crucially no longer the only one. If you fit a non-stabilized lens, you need to enter its focal length from 8mm to 1000mm via the main menu system to benefit from the body stabilisation system. When enabled, the Panasonic Lumix DMC-GX7 automatically compensates for camera shake, which is a slight blurring of the image that typically occurs at slow shutter speeds when the camera is hand held. There are two different modes, Mode 1 is on all the time including image composition, and Mode 2 compensates for up and down movements only (which in turn allows you to pan the camera). In practice we found that it does make a noticeable difference. You don't notice that the camera is actually doing anything different when anti-shake is turned on, just that you can use slower shutter speeds than normal and still take sharp photos. The built-in Wi-Fi function (IEEE 802.11 b/g/n) lets you use your smartphone to change the camera settings (focus setting, exposure compensation, ISO, WB and Photo Styles) and even fire the shutter button remotely (including interval video recordings), while the auto transfer function automatically backs up your photos onto a tablet. You can also use GPS data from your smartphone to record the shooting location onto your images. The DMC-GX7 is also one of the first compact system cameras to feature NFC (Near Field Communication) technology (the same technology that's used for mobile payments), which allows you to connect it to a compatible internet enabled device or another NFC-enabled camera by simply tapping them together. The Panasonic Lumix DMC-GX7 also has a time lapse function in which you can set the time interval and the number of images to take, plus a multi-exposure option that lets you combine up to four exposures in a single frame, while the new Stop Motion Animation mode allows you to create unique stop motion videos. The top shutter speed has also been increased to a very impressive 1/8000th second, making the GX7 one of the first compact system cameras with a mechanical shutter to offer such a high speed, and great for freezing fast-moving objects or shooting wide-open with fast lenses, even in bright conditions. On the front of the Panasonic Lumix DMC-GX7 is a small focus-assist and self-timer indicator lamp, lens release button, metal lens mount and the already mentioned chunky hand-grip. On the bottom is a metal tripod socket, importantly in-line with the middle of the lens barrel, and the shared battery compartment and SD/SDHC/SDXC memory card slot. The GX7 manages 320 shots using the supplied DMW-BLG10E 7.2V 1025mAh rechargeable Li-ion battery. 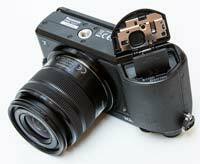 The right-hand side of the camera, looking from the rear, is empty save for the small NFC symbol (more on this later). On the left are ports for the remote socket, HDMI and AV Out/Digital connections, hidden beneath a plastic flap that annoyingly can only be opened when the LCD screen is tilted outwards. Underneath is a small microphone, with protruding metal eyelets on either side of the body for the supplied camera strap. Unfortunately, Panasonic don't include a HDMI cable as standard in the box, which means that you'll have to purchase one separately to take advantage of this camera's HD connectivity. The top of the GX7 somewhat amazingly houses the tilting electronic viewfinder, a flash hotshoe, small stereo speakers, a cleverly designed built-in pop-up flash, a one-touch movie record button, tactile shutter button surrounded by a control dial for setting the aperture/shutter speed, and a traditional recessed shooting mode dial with integrated on/off switch. Phew! Despite having so many controls in such a small space, Panasonic have achieved the no mean feat of making the GX7's top-plate feel relatively uncluttered, with only the dedicated button for the Intelligent Auto mode being sacrificed. The Panasonic GX7 has a dedicated button on the rear for opening the pop-up flash. Given the small size of the GX7, fitting a built-in flash was no mean feat, as proven by the double-hinged design which is quite a technical achievement. Although not particularly powerful with a guide number of just 7.0, the GX7's flash is perfectly adequate for fill-in effects at close-quarters. The shooting mode dial offers the usual selection of Program, Aperture Priority, Shutter Priority, and Manual for the more experienced photographer. An optional exposure meter can be displayed in the P/A/S/M shooting modes which graphically shows the relationship between shutter speed and aperture, with a color-coded warning that alerts users when the settings are not in the proper range. Intelligent Auto mode tries to make things as easy as possible for the complete beginner. It allows you to point and shoot the camera without having to worry about choosing the right scene mode or settings. Intelligent Auto Mode automatically determines a number of key criteria when taking a picture, including selecting the most appropriate scene mode (from 5 commonly used presets) and ISO speed, and turning face detection (up to 15 faces), image stabilization and quick auto-focus on. More beginner-friendly Scene modes are also available. One scene mode particularly worthy of mention is the Peripheral Defocus option, which makes it easy for beginners to achieve a blurred background / sharp subject effect without having to understand what apertures are. For more advanced users, the GX7 offers a graduation curve which can be used to individually tune the contrast behavior of the camera. The highlights and shadows can be adjusted via the touchscreen or front and rear control dials to create your own unique look, which can then be stored on one of three custom settings (or one of the three presets can be selected). Additionally there are 3 custom shooting modes which allow you to configure your favourite camera settings and quickly access them via the dedicated C1, C2 and C3 modes. The GX7's range of Creative Controls, denoted by an artist's palette, has been greatly expanded from just 8 options on the GX1 to 22 on the GX7 - you can see examples on the Image Quality page. You can also fine-tune each effect via a series of simple on-screen sliders for color, saturation and contrast, complete with a real-time preview of your changes. The camera even provides filter recommendations and on-screen scene guides. The Creative Movie shooting mode allows you to set the shutter speed, aperture or both settings manually during recording (a Program option is also available). Changing the shutter speed is especially suitable for shooting fast-moving subjects, whilst the ability to control the aperture is convenient when there are several subjects at different distances. In practice this system works well, allowing some really creative effects, but there are a couple of drawbacks. Firstly the operating sound of the control dials is very audible in the movie, so you'll need to edit the soundtrack later to remove it or use the Silent Operation mode which operates the zoom, aperture, shutter speed, exposure compensation, ISO sensitivity and mic level adjustments via the touch-screen. Secondly, you can't set the shutter speed to below 1/30th second, instantly ruling out more creative slow shutter-speed effects. One of the GX7's main innovations is its touchscreen interface, with an attractive user interface that's easy on the eye. Panasonic have wisely restricted the amount of things that you can do by interacting with the screen, and indeed you can still operate most things on the camera without having to push and prod the LCD at all. But you would be missing out on a lot of genuinely useful functionality that really improves the shooting experience. The most immediately noticeable function is the ability to use the 1-area AF mode to focus on your main subject simply by touching it on the LCD. If the subject then moves, the GX7 cleverly follows it around the screen using the the AF tracking function. If the subject exits the frame entirely, simply recompose and tap it again to start focusing. Impressive stuff that makes focusing on off-center subjects fast and intuitive. It is a little too easy to accidentally press the screen and set the focus point to the wrong area for the current subject, but a press of the Display button will center the AF point (or you can turn this feature off altogether). When Intelligent Auto is switched on, the GX7 changes the scene mode used when you touch the subject, for example selecting portrait mode if you touch a face and macro mode if you touch a close-up flower. If you prefer to manually focus rather than use the very responsive auto-focus system, you can magnify any part of the subject by up to 6x by simply dragging the image around the screen and pinching your fingers together. In the pin-point AF mode the magnification can be set from 3x to 10x enlargement in 0.1x gradients. The final touchscreen ability from an image composition point of view is the ability to release the shutter, with a small icon on the right hand screen enabling this functionality, and then a single on-screen tap all that's required to take the picture. All of the menu options can be changed via the touchscreen interface. You can also control image playback by touching the screen, with the ability to tap a thumbnail to see the full-size version, scroll through your images by dragging them from side to side, and magnifying them up to 16x. Above the LCD screen is the aforementioned electonic viewfinder, a button for manually switching between the viewfinder and LCD screen (which can optionally be configured as the fourth configurable Function button), and a flash button for popping-up the built-in flash. To the right is a useful AF/AE Lock surrounded by a switch for choosing between the auto and manual focus modes. The GX7 offers three auto-focus modes - AF Single, AF Flexible, AF Continuous. AF Flexible is a relatively new mode which conventionally locks the focus when the shutter button is half-pressed, but then automatically resets it if the subject moves. Notably the GX7 can focus ona subject in very low light situations, such as under starlight, with Panasonic claiming an industry leading level of -4EV. 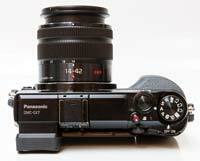 Focus Peaking is also new to the GX7, if not to recent compact system cameras. When enabled, it graphically shows the peak of focus in the MF and AF+MF modes by displaying an outline around the subject. The detection level can be set to 'High' or ‘Low’ and a colour can be selected In ‘High’ these are light blue, yellow or green and in 'Low' blue, orange or white can be selected. Alongside this is a thumb-operated control dial for setting the aperture and/or shutter speed and also selecting menu options. Cleverly this dial can be pushed in to toggle between the aperture/shutter speed and exposure compensation. Directly to the right of the LCD screen is the Quick Menu / Function 1 button, which is again customisable to suit your way of working, although we can't see why you'd want to turn off the Quick Menu, which as the name suggests provides quick access to most of the principal controls via an onscreen menu. Depending on the current shooting mode, this displays up to 13 options that can all be changed via the touch-screen. You can also configure it to include up to 10 out of 19 available settings simply by dragging and dropping the onscreen icons. You can still access all of these options from the main menu system too if you wish. Underneath is a self-explanatory Playback button alongside a Display button which toggles detailed settings information about each picture on and off, such as the ISO rating and aperture / shutter speed. Underneath again is a traditional 4-way navigation D-Pad system with Menu/Set button in the centre. Pressing left, up, right and down on the D-Pad buttons selects AF Mode, ISO Speed, White Balance and Burst / Self-timer options respectively. The main menu system on the DMC-GX7 is straight-forward to use and is accessed by pressing the Menu/Set button in the middle of the navigation D-Pad. There are five main menus represented by large icons, Record, Motion Picture, Custom, Setup and Playback. As an indication of how configurable the GX7 is, the Custom menu has 39 different options, allowing you to fine-tune this camera to suit your way of working. If you have never used a digital camera before, or you're upgrading from a more basic model, reading the easy-to-follow manual before you start is a good idea. Unfortunately Panasonic have only chosen to supply a basic guide in printed format, with the full manual only available as a PDF on the product CD. In terms of movie shooting, the GX7 offers Full HD 1920 x 1080 60p/50p smooth, high quality video recording in AVCHD Progressive and MP4 formats complete with stereo sound. Higher quality sound can also be recorded via Dolby Digital, and there's also a useful wind cut function which blocks out most of the noise from background wind. The dedicated movie button on the top makes it simple to start record video footage at whatever quality level is currently selected. The HDMI port allows you to connect the GX7 to a high-def TV set, but only if you purchase the optional HDMI mini-cable. You can extract a frame from a movie during playback and save it as a small still image. New to the GX7 is the ability to use the touchscreen interface whilst recording a movie. Touch AF allows you to set the focus with one touch, while AF Tracking helps ensure the focus stays on a subject or face, even if they move around. The Panasonic GX7's Intelligent Auto mode works for movies as well as for still photos. Simply select the iA shooting mode on top of the camera, then the Movie Record button. The Intelligent Scene Selector automatically determines the most suitable Scene mode from five options - Portrait, Scenery, Low Light and Close-up or Normal modes. Face Detection automatically detects a face in the frame and adjusts the focus, exposure, contrast, and skin complexion. Intelligent Exposure continually checks the ambient light level and adjusts the exposure setting as conditions change to prevent blown highlights and blocked shadows. The Image Stabilizer helps prevent blurring from hand-shake when using a compatible lens or via the camera body. You can use any zoom lens during recording with focusing set as for still images. On the negative side, you'll find that if you choose continuous auto-focus, areas of the video will be blurred before becoming sharp again as the camera tries to refocus. On a more positive note, the the GX7 is quite fast at re-focusing (although not as fast as for still images), and having this system is much better than not being able to auto-focus at all, as with some current DSLR cameras that offer video recording. Hand-holding the GX7 during movie recording inevitably leads to obvious shake, despite the optical image stabilization, so for best results you'll need a dedicated video tripod. One great benefit of the touch-screen control system is that Touch Auto Focusing is available in movie recording, enabling pro-level rack-like focusing simply by pointing at the subject on the LCD screen. The Intelligent Resolution mode makes a standard image look like a higher resolution one by processing the contour areas, texture areas and smooth areas individually. There are three available strengths - low, standard and high - and an Extended option which increase the zoom range. Despite all the clever behind-the-scenes processing, it's fairly easy to tell which image was taken with Intelligent Resolution turned on and which one with it turned off due to unwanted artifacts appearing, particularly if viewing onscreen at 100% magnification. While the difference isn't quite so apparent on a print up to A3 in size, we're not convinced enough to recommend regularly using it. Intelligent Dynamic adjusts the exposure setting to record more detail in the highlights and shadows, with three strengths available - low, standard and high. It's actually very effective for high-contrast scenes when the camera tends to blow-out the highlights and block-up the shadows. New to the GX7 is the HDR mode, which combines 3 frames taken at different exposures to create a single image with increased dynamic range, while the Panorama mode allows you to take panoramic images very easily by 'sweeping' with the camera and even apply creative effects. Unlike a conventional DSLR camera which uses a phase detection auto-focus system, the GX7 employs the same Contrast AF that is commonly used by compact cameras. Panasonic have published marketing data which suggests that the GX7's Light Speed AF system is as fast, if not faster, than a typical DSLR camera's, with a claimed speed of just 0.06 second when used with certain lenses,. In practice we noticed very little difference in speed between the GX7 and a DSLR, and there were also very few occasions when the GX7 failed to lock onto the subject, especially when using the centre AF point. There are a wide range of AF modes on offer, including multiple-area AF with up to 23 focus areas, 1-area AF with a selectable focus area, Face Detection, AF Tracking and Pinpoint. The GX7 also has a useful Quick AF function that begins focusing as soon as you point the camera. The start-up time from turning the Lumix GX7 on to being ready to take a photo is very impressive at less than 0.5 seconds. It takes about 1 second to store a JPEG image, allowing you to keep shooting as they are being recorded onto the memory card - there is a barely perceptible LCD blackout between each image. Storing a single RAW image takes around 4 seconds, but thankfully it doesn't lock up the camera in any way - you can use the menu system or shoot another image while the first file is being written to memory. The Panasonic Lumix GX7 has a pretty good Burst mode which enables you to take 5 frames per second for an unlimited number of JPEG images at the highest image quality, or 9 RAW images, or 4.3fps if continuous auto-focusing is selected. There is a much faster 40fps option, but it only records Small sized images. Once you have captured a photo, the Panasonic Lumix GX7 has an average range of options when it comes to playing, reviewing and managing your images. You can instantly scroll through the images that you have taken, view thumbnails (up to 30 onscreen at the same time and in a Calendar view), zoom in and out up to 16x magnification, view slideshows, delete, protect, trim, resize, copy and rotate an image. You can also select favourite images, change an image's aspect ratio, divide a video and set the print order. The new Clear Retouch function quickly and accurately removes any unwanted objects or figures in an image by just tracing over them with your fingertip.